ABSTRACTLymphangiomas are benign malformations of the lymphatic channels, diagnosed in infancy or early childhood. These malformations are often found in the head and neck region. In the oral cavity, the tongue is the most common site, while lesion on the palate is rarely reported. This is a case report of oral lymphangioma arising from the palate in a 65-year-old female. 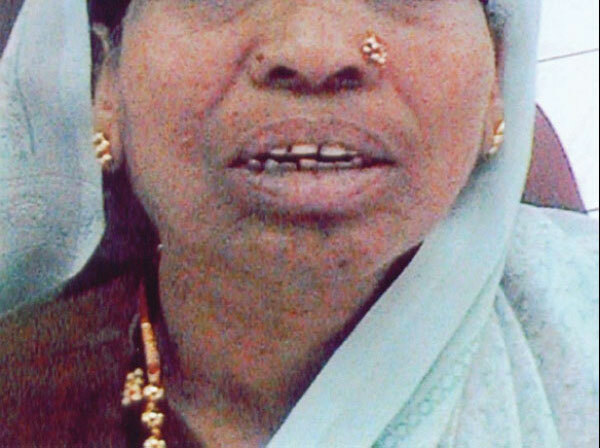 A 65-year-old female reported to KLES’s Institute of Dental Sciences, Belgaum with a chief complaint of a small nodular growth on the anterior palate that she noticed 4 to 5 months earlier. The patient became concerned when the lesion continued to grow. No history of trauma or loss of sensation was present. 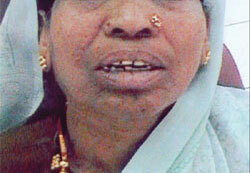 The lesion was asymptomatic; however, she complained of bleeding when brushing and eating. Past medical and dental histories were insignificant. On examination, the patient was noted to have an average build and had bimaxillary protrusion with deep bite (Figure 1 View Figure). An intraoral examination revealed a solitary nodular ovoid swelling in the anterior region of the mid palatal area adjacent to incisive papilla, extending in the anterior palatal aspect of the right central and lateral incisors. The lesion’s surface was smooth and reddish, and the swelling measured 1 cm × 1.5 cm. The patient exhibited poor oral hygiene and generalized periodontitis. On palpation, the lesion was soft, tender, and compressible, and showed bleeding on probing. Overlying mucosa had firmly adhered to the lesion (Figure 2 View Figure). Intraoral periapical and occlusal radiographs showed no bony changes. Clinical differential diagnosis of pyogenic granuloma, hemangioma, inflammatory hyperplasia, papillary hyperplasia, and peripheral giant cell granuloma was made. Excisional biopsy was performed using local anesthesia for histopathologic analysis. The gross specimen measured 1 cm × 1.5 cm and was firm, whitish brown, and irregularly shaped. The tissue was routinely processed, sectioned, and stained with hematoxylin and eosin (H&E). 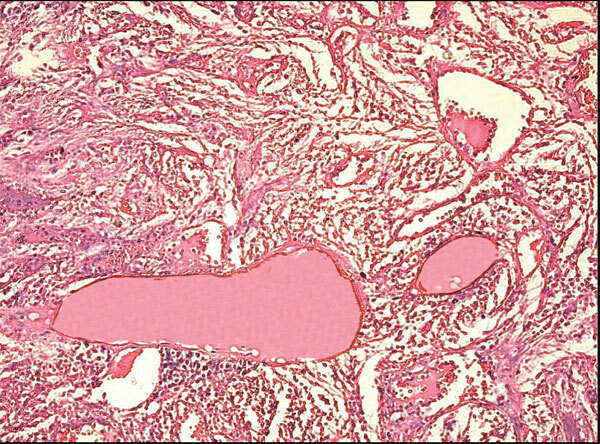 Histologic examination of the section showed a lobulated mass of tissue with parakeratinized, stratified squamous epithelium overlying the stroma. In some areas, epithelium was nonkeratinized and ulcerated. Epithelium showed irregular proliferation with long, narrow rete pegs. 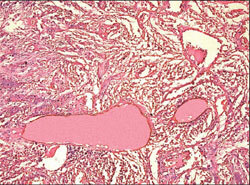 Juxta-epithelial stroma showed presence of numerous large cavity-like spaces. A few of these spaces appeared to consist of eosinophilic, homogeneous material, suggestive of lymph fluid. The deeper part of the stroma showed scattered lymphatic channels, and among them was loosely arranged fibrocellular stroma with chronic inflammatory cell infiltration (Figure 3 View Figure and Figure 4 View Figure). Based on these histopathologic features, lymphangioma was diagnosed. One week postsurgery, the patient returned for suture removal. The wound appeared to be healing normally. The patient was followed up regularly. No signs of recurrence were present, with follow-up for 3 years. The most common site is the head and neck, particularly the posterior triangle; the anatomic location of the embryologic sacs may be a factor.1,4 In the oral cavity, the common site is anterior two-thirds of tongue, resulting in macroglossia. The irregular nodularity of the tongue surface, with grey and pink projection, is the most common sign and, when associated with macroglossia, is pathognomonic of lymphangioma. These tumors can occur on the palate, buccal mucosa, and lip.5 Clinically, the lesion may present with surface bleeding, hemorrhage, or repeated infections.2 The patient presented with a nodular growth in the anterior of the palate. This case of intraoral lymphangioma was of interest as it was found at an uncommon site and at an unusually advanced age of the patient. The follow-up of 3 years showed no recurrence, and the patient leads a normal life. 1. Schwartz RA, Fernandez G. Lymphangioma. EMedicine Web site. http://emedicine.medscape.com/article/1086806 -overview. Accessed June 9, 2010. 2. Edwards SP, Helman JI. Oral lymphangioma. EMedicine Web site. http://emedicine.medscape.com/article/1076948 -overview. Accessed June 9, 2010. 3. Brennan TD, Miller AS, Chen SY. Lymphangiomas of the oral cavity: a clinicopathologic, immunohistochemical and electron-microscopic study. J Oral Maxillofac Surg. 1997;55(9):932-935. 4. Ikeda H, Fujita S, Nonaka M, et al. 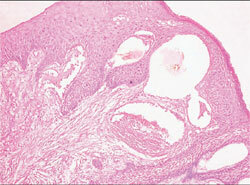 Cystic lymphangioma arising in the tip of the tongue in an adult. Int J Oral Maxillofac Surg. 2006;35(3):274-276. 5. Livesey JR, Soames JV. 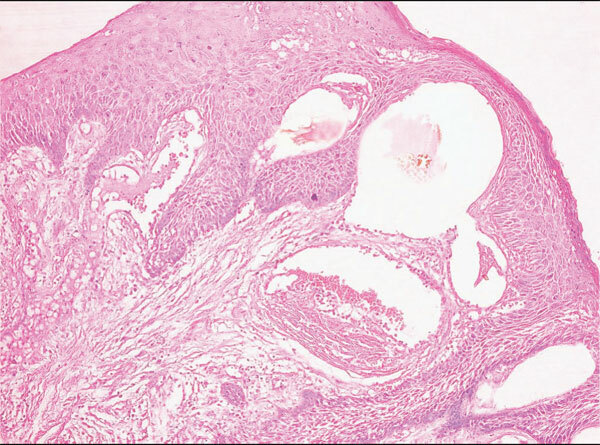 View from beneath: pathology in focus cystic lymphangioma in the adult parotid. J Laryngol Otol. 1992;106:566-568. 6. Shafer WG, Hine MK, Levy BM. Textbook of Oral Pathology. 5th ed. Delhi: Elsevier India Pvt Ltd; 2006:207-208. 7. Neville B, Damm DD, Alllen CM, Bouquot J. Oral and Maxillofacial Pathology. 2nd ed. Delhi: Elsevier India Pvt Ltd; 2004:475-476. Figure 1 Extraoral photograph showing bimaxillary protrusion. Figure 2 Intraoral photograph showing the lesion. Figure 4 Photomicrograph showing lymphatic channels in fibrocellular stroma (H&E, original magnification 10x). Vijayalakshmi S Kotrashetti is a lecturer in the Department of Oral Pathology and Microbiology, Institute of Dental Sciences, KLE Academy of Higher Education, Belgaum, Karnataka. Alka D Kale is a professor in the Department of Oral Pathology and Microbiology, Institute of Dental Sciences, KLES Academy of Higher Education, Belgaum, Karnataka. Yasmin Satpathy is a postgraduate student in the Department of Oral Pathology and Microbiology, Institute of Dental Sciences, KLES Academy of Higher Education, Belgaum, Karnataka.